REVERSE and Designcircuit are pleased to present a series of talks in conjunction with the Crisis As Calling competition, which solicits innovative, design-based solutions to situations or conditions caused by crisis. Judged by a panel of renowned experts, innovators and artists, the competition is open to the public. A select group of applicants will be given stipends to create physical models of their proposals, which will be featured in an exhibition at REVERSE, an art space in Williamsburg, Brooklyn, and included in a publication by Van Alen Books, which is New York City’s only book emporium and gathering place devoted to architecture and design publications. 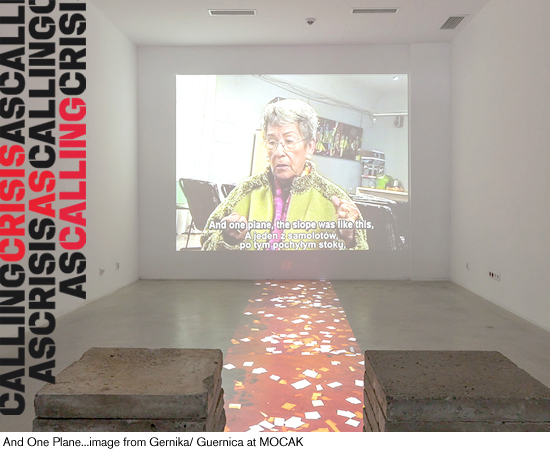 Our first talk in the series will take place at REVERSE Art Space on April 4th and will feature Anita Glesta, a Brooklyn-based artist, who teaches at SAV, and member of the jury panel for Crisis is Calling. Anita Glesta’s work has been exhibited extensively in New York City, beginning in 1984 with a solo show at White Columns Gallery. Her work was shown at the Sculpture Center, the Queens Museum, the Brooklyn Museum, and many New York galleries before she moved to Sydney in 1994. Since her return to New York in 2000, Glesta has created site-specific works in New York, Europe, and Australia. In 2004, Glesta was commissioned by the General Services Administration’s Art in Architecture Program to create a permanent seven-acre landscape intervention for the Census Bureau Headquarters Building in Suitland, Maryland. In 2007, the Lower Manhattan Cultural Council produced Glesta’s “Gernika/Guernica,” a multimedia site-specific public art project, which commemorated the 70th anniversary of the tragic bombing of the Basque town Gernika by Nazi Germany. Most recently, Glesta’s work features video installation as medium for exploring themes of environment, site and community. Glesta’s public installation, Watershed, will premiere at the foot of the Manhattan Bridge in May 2013 and will travel to waterfront cities internationally. Conceived before Hurricane Sandy devastated the city, Watershed will draw a connection between New York’s history as an island of water and the world’s current condition in light of climate change.